Red Spot benefits from a 15-year maturation in three types of barrels for a high quality result and rich and complex flavours. Like the Green Spot and the Yellow Spot, the name Red Spot originates from the marking of barrels of the Mitchell family to signal the different ages of whiskey while keeping their content secret. 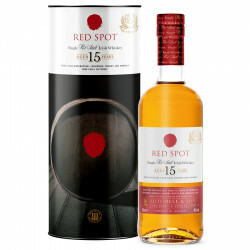 Red Spot is aged 15 years old. As a new chapter in this story, Red Spot has remained a treasured secret until now. This Irish whiskey is now available to whiskey fans. Red Spot Irish Single Pot Still whiskey is aged in 3 casks over 15 years old: American Bourbon casks, Spanish Sherry casks and Marsala Sicilian wine casks. These finishes contribute to develop rich and complex flavours for a very high quality whiskey. Unfiltered cold, the 15-year-old Red Spot is bottled at 46°. Single Pot Still whiskey is unique to Ireland in general and especially to the Midleton Distillery, Co. Cork just as the Single Malt is Scotland's signature. This appellation can be considered the quintessence of the Irish whiskey style. Green Spot was created for the Mitchells, a family of wine merchants that started its activity in Dublin in 1805. In 1887, they started ageing and selling Irish whiskey, sending their empty wine, sherry and port casks to Bow Street distillery (Jameson) which would fill them before leaving them to mature in their cellars for a number of years. “Spot” refers to the marks painted by the Mitchells on the casks of different ages. To start with they used a green spot, then a blue, red and even a yellow one, but the Green Spot came out as the most successful and settled as a hallmark product. Green Spot and Yellow Spot are today owned by the Midleton distillery. In 1966, John Jameson & Son decided to mingle with whiskey production companies John Power & Son and Cork Distillers Company and established the Irish Distillers Ltd., a sub-company today part of the Pernod-Ricard group. The complete whiskey production is today located in a new building in Midleton distillery, Cork. Midleton is one of the most modern distilleries in the world. Its production capacity reaches near to 19 million litres a year. 13 stills are operating and make all types of Irish whiskeys combined (Irish pot still, single malt, single grain…). The old distillery building, much more impressive, has been kept and turned into a museum. Named “The Jameson Heritage Center”, we may admire an amazing water wheel from 1852, a stationary steam machine used to power the distillery and the biggest still the world. It is in one of these old Georgian architecture stone buildings with red shutters that Barry Crockett, the current Midleton distillery Director, was born. The Old Midleton style: even with a great range of expressions, Midleton’s whiskeys develop a unique character. They have a specific fruity nose (red fruits) with a spicy backdrop and sweet notes of grains. The distillery produces exceptional pure pot still whiskeys, such as Redbreast or the famous Spot whiskeys: Green Spot and Yellow Spot. Nose: the spices of Pot Still match the notes of cooked fruits (apple, mango and black cherry). Hazelnut notes associated with grilled American oak. Palate: ripe fruit from Marsala barrels with notes of red pepper and crushed black pepper complemented by notes of American oak and barley. Finish: long, complex, fruity and spicy.